Posted on Thursday, December 28th, 2017 at 8:10 am. Full of big wins, new records and exciting new products, 2017 was a great year for Team GOODE. Here’s a look at some of the biggest stories of 2017. Regina Jaquess once again led the way for Team GOODE at the World Championships, securing an unprecedented slalom/overall three-peat (2013, 2015, 2017) at the 2017 iteration held in Paris last September. Her slalom win set the all-time mark for Women’s world slalom championships at four, breaking the record of three that she previously shared with legends Liz Allen, Cindy Todd and Helena Kjellander. Regina’s four World Slalom titles came in 2005, 2013, 2015, and now, 2017. The overall gold is the fifth of her career, the most ever for a Woman and second only behind Patrice Martin all time. She also earned a silver medal in jumping to go along with her team gold, giving her four medals during the 2017 championships. Additional Team GOODE highlights included Felipe Miranda winning his second career World overall title and six of the 12 Women’s slalom finalists skiing on GOODEs. GOODE skiers won 14 national slalom titles – easily more than any other ski manufacturer – at the 75th GOODE Water Ski National Championships held in August at San Marcos River Ranch in Martindale, Texas. Girls 3 – Brooke Baldwin; Womens 1 – Ruth McCreary; Womens 2 – Keri McClure; Womens 3 – Lauren Malitz; Womens 4 – Stephanie Stange; Womens 5 – Joy Kelley; Womens 6 – Janie Fausold; Womens 9 – Pat Fischer; Mens 1 – Chris Kuykendall; Mens 3 – Barton Rachwal; Mens 4 – Chad Scott; Mens 5 – Greg Sund; Mens 6 – Steve Ware; and, Mens 7 – Steve Raphael. XTR™: Introduced at the GOODE Nationals in August, the XTR combines the world record-breaking DNA of the Nano 1XT with a trailblazing new rocker profile to create the highest performing ski in the GOODE lineup. The result? Multiple National titles, a world slalom championship, a world-record tie, two U.S. National records, and countless PBs. 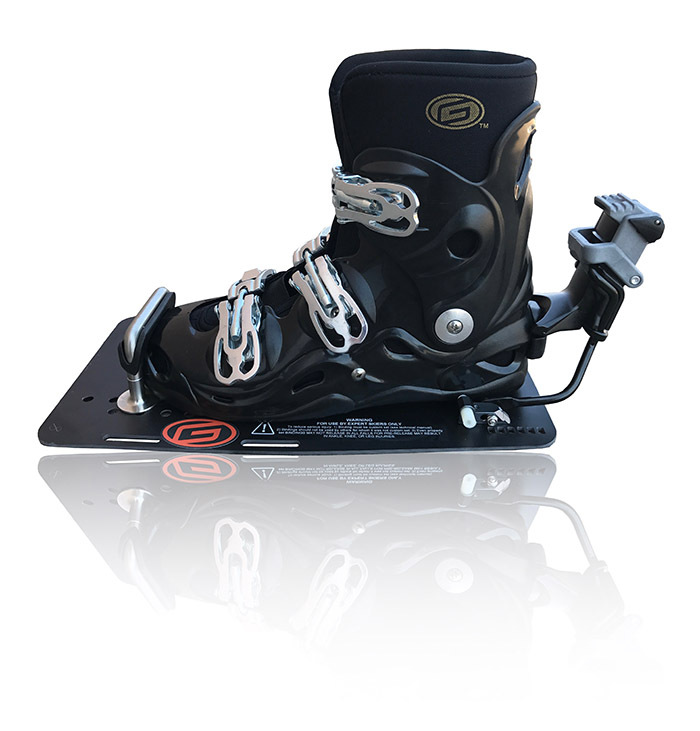 Power-G-Flex™: GOODE Skis and Reflex partnered to create the Power-G-Flex system, bringing the comfort and performance long associated with the PowerShell 5 boot to the sport’s leading mechanical release system. A specially designed injection molded piece connects the PowerShell boot to the Reflex toe bar, and an added rear heal cleat secures the boot to the mechanical release. The PowerShell/Reflex pairing will come standard mounted to a G-10 carbon plate and will also feature a rear half-boot option. The FUTURE™: GOODE’s first-ever ski designed exclusively for young up-and-coming buoy slayers, the FUTURE features all the pure carbon-fiber construction and world-record DNA you’ve come to expect in a GOODE, but with kid-friendly graphics, a more forgiving flex pattern and a great price. The FUTURE is a high-performing, no-compromises ski that will get tomorrow’s little rippers in the course and into deep shortline. Adam Sedlmajer. Photo by Des Burke-Kennedy/IWWF. GOODE pro team members scored big victories all over the world in 2017. Thomas Degasperi got the year off to a great start by taking the Moomba Masters title, then things kept rolling with victories from Clementine Lucine (European Championships, Fun Gliss Pro Am), Taylor Garcia (Jr. U.S. Open), Brooke Baldwin (California Pro Am), Adam Sedlmajer (World Games and the Andy Mapple Pro Am), Felipe Miranda (World overall). And of course, there’s Regina (world slalom and overall, San Gervasio, Malibu Open and Swiss Slalom Pro). After four rounds and the elimination of 14 skiers, the 2017 GOODE Bracket Challenge came down to No. 1 seed vs. No. 2. Dave Miller vs. Greg Badal. Watch the video above to see who won. The U.S. National record books will look dramatically different at the end of 2017 than they did at the beginning of the year, thanks in large part to GOODE skiers. Chet Raley first tied the Mens 6 National record, then proceeded to top it twice more, eventually ending up with a pending record of 2 buoys at 41 feet off. Joy Kelley set the Womens 6 slalom record three different times herself, ending the year with a pending record of 2 at 38 off. Bob Hardeman set a pending Mens 8 record of 2-1/4 at 39-1/2 off, Cyndi Benzel a Womens 7 pending record of 1/2 at 38 off, Steve Raphael a Mens 7 pending record of 5-1/4 at 39-1/2 off (since disallowed due to boat path deviation) and Bill Mahan tied the Mens 8 record of 2 at 39-1/2 off. See the full list of pending records here. When the October 2017 IWWF preliminary world rankings list was released, seven GOODE skiers earned top spots: Open Women – Regina Jaquess, Under 21 Women – Brooke Baldwin; Junior Women – Brooke Baldwin; 35+ Women – Karen Truelove; Under 21 Men – Brando Caruso; Junior Men (tied) – Griffin Stange; 55+ Men – Dave Miller; and, 65+ Men – Steve Raphael. First time Nationals competitor Addy Flint. Twelve skiers not only competed in their first-ever Nationals last August at San Marcos River Ranch, but they had their entry fees paid too. The #FirstTimersForFree promotion was part of GOODE’s effort to encourage Nationals participation and reward achieving major goals. Participating first time Nationals competitors were: Josh Gardner – Boys 3, Plainfield, IL; Joey Hayes – Mens 3, Decatur, MS; Brian Kreis – Mens 4, Miami, FL; Isak Nightingale – Boys 2, Lake Elmo, MN; Reed Favret – Boys 2, Windermere, FL; Sharon Baker Brown – Womens 7, Orlando, FL; Addy Flint – Girls 1, Lawton, OK; Don Stanford – Mens 8, Pleasant Hill, CA; Kate Lemcke – Womens 1, Saint Louis, MO; Landon Geels – Boys 3, Denver, CO; Brendan Schultz – Boys 2, Dow, IL; and, Justin Bloyer – Mens 3, Lake Elmo, MN. Posted on Friday, October 27th, 2017 at 9:17 am. Congratulations to Chet Raley for setting a pending U.S. National Mens 6 slalom record with 1-1/2 buoys at 41 feet off at the Oct. 3-event Record Sunday last weekend at Okeeheelee Park. Chet’s new mark tops the previous record of 1 at 41 off, which he scored earlier this summer and co-held with Kris Lapoint, and is the ninth pending U.S. National slalom record set on GOODEs this year. Joy Kelley owns three of those marks topping out with a pending Womens 6 record of 2 at 38 off. Bob Hardeman set a pending Mens 8 record of 2-1/4 at 39-1/2 off, Cyndi Benzel a Womens 7 pending record of 1/2 at 38 off, Steve Raphael a Mens 7 pending record of 5-1/4 at 39-1/2 off and Bill Mahan tied the Mens 8 record of 2 at 39-1/2 off. For a full list of pending U.S. National records click here, or here for the list of approved records. Posted on Monday, September 18th, 2017 at 9:25 am. Vennesa Vieke took the SportsInsurance.com Queens Cup title at Little Mountain in North Carolina, beating Chelsea Mills 1.5@38 to 0.5@38 in the head-to-head finals to earn the win and a $2,000 cash prize. Fellow GOODE skiers Joy Kelley and Cyndi Benzel took third and fifth, respectively at the Queens Cup, with Joy setting a pending National Womens 6 record of 1@38 and Cyndi Benzel setting a pending National Womens 7 record of 0.5@38. Bob Hardeman scored 2@39 at the NorCal MasterCraft BallOfSpray Cash Prize at Bell Acqua Lake 3 to set a pending National Mens 8 record. In the pro ranks, Clementine Lucine took first in Women’s slalom at the Fun Gliss Pro Am in France. Her fellow GOODE teammate Thomas Degasperi finished second in the Men’s slalom event. Posted on Tuesday, August 15th, 2017 at 12:43 pm. GOODE skiers once again dominated the gold medal count at a Nationals as 14 slalom titles – easily more than any other ski manufacturer – were won on GOODEs at last week’s 75th GOODE Water Ski National Championships held at San Marcos River Ranch in Martindale, Texas. Podium finishes by Luka Zazadze (Boys 1 – 4th), Griffin Stange (Boys 3 – 3rd), Blake Keller (Boys 3 – 4th), Landrie McLain (Girls 1 – 2nd), Ali Garcia (Girls 3 – 4th), Steve Grubbs (Mens 3 – 5th), Joe McCreary (Mens 4 – 2nd), Dennis Longo (Mens 8 – 4th), Bob Hardeman (Mens 8 – 5th), Greg Badal (Masters Men – 2nd), Trish Burt (Masters Women – 2nd), Brian Detrick (Open Men – 3rd), Ben Favret (Open Men – 5th), Megan Lambert (Womens 1 – 5th), Lori Krueger (Womens 4 – 2nd), Carol Brooks (Womens 5 – 2nd), and Shirley Coble (Womens 8 – 3rd). It’s difficult to track hundreds of skiers across multiple lakes over the course of four days of action, so if we failed to include you in the list above, or mistakenly did so, please accept our apologies and email us the details at team@goode.com. Posted on Wednesday, October 15th, 2014 at 12:40 pm. Sunset Lakes was a sea of colors as the flags of 29 countries flew over last weekend’s 35+ World Water Ski Championships in Groveland, Fla. But it was orange and black that were the most conspicuous on the slalom podiums as GOODE skiers won six of eight golds and 14 of 24 slalom medals. Team GOODE swept the top spot on all four Women’s slalom podiums, as April Coble-Eller (35+), Lori Krueger (45+), Joy Kelley (55+), and Ruth Johnston (65+) took home gold medals. Additional GOODE Women’s skiers earning medals were Florence Trible (bronze, 35+), Patrician Cordiero (bronze, 45+), Cyndi Benzel (silver, 55+), Kandise Bertelson (55+), and Shirley Coble (bronze, 65+). On the Men’s side, Chet Raley and Richard Lambert won gold medals in Men’s 55+ and 65+, respectively. Jay Leach (bronze, 35+), Lonnie Harris (bronze, 55+) and Dennis Longo (bronze, 65+) also earned medals.